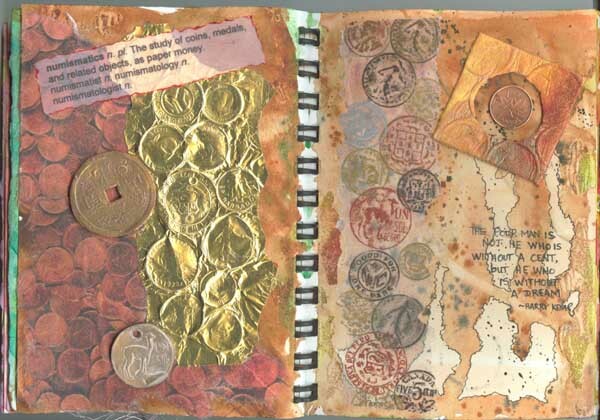 Page 9 "Coins": I used Naples yellow and browns in a runny watery technique. When dry I outlined the light areas with a black nexus pen. I printed the pennies on tissue paper and glued it to my page. I lay down a bunch of coins, used a thin gold metallic foil and rubbed the coin impressions. I used sculpey to create the oriental coin and the llama coin. On the right side I again lay down a bunch of coins, used tracing paper and prismacolor sticks and rubbed the impressions. I used a coin mount and decorated it with some impressed paper and stuck a copper penny in the window. 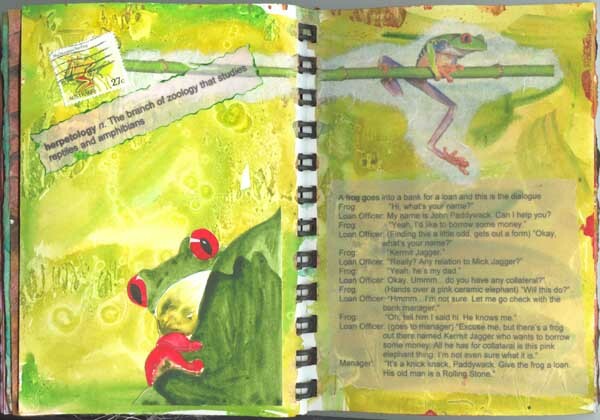 Page 10 "Frogs": I used yellows and greens, rubbing alcohol and saran wrap. I printed the frog on a branch onto mulberry paper. I added an Australian frog stamp I got from a ByHander, and added one of my watercolor frogs I've been using in our ArtIdeaJournals. Words: herpetology n. The branch of zoology that studies reptiles and amphibians. The words on the right side is more of a joke about a frog who goes to the bank for a loan and claims he's Mick Jagger's son. Punch line: It's a knick knack Paddywack. Give the frog a loan. His old man is a rolling stone. 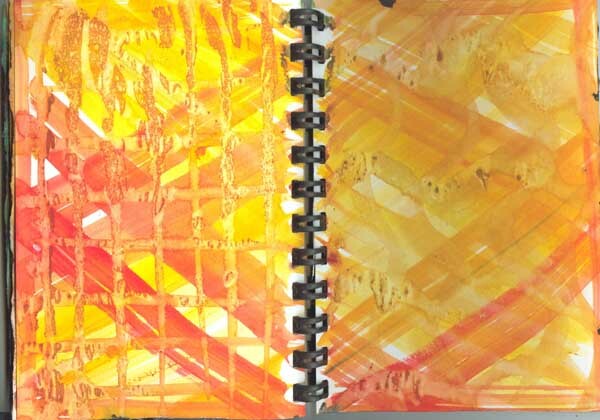 Page 11 "Love": I used reds and yellows in a diagonal curved stroke pattern and inscribed patterns of hearts and wavy lines into the wet paint. 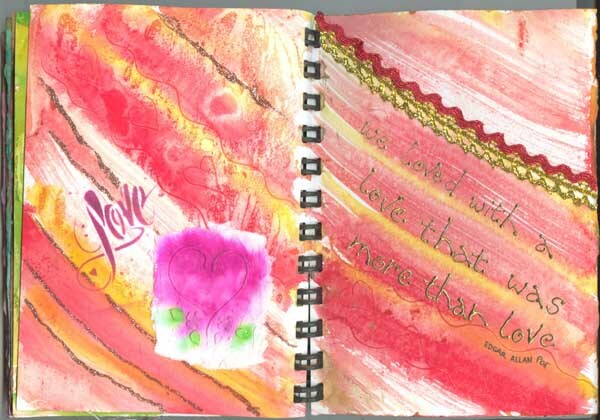 On the left side, when dry I used a stencil and stamp pad ink for the word Love. I added glitter to some of the edges of the lines. I pressed some toilet paper into a stencil of a heart, and while wet dropped some color into it. On the right I added some rickrack ribbon in gold and red along one of the lines. I wrote the words using my low wattage iron and rheostat and gold embossing powder. 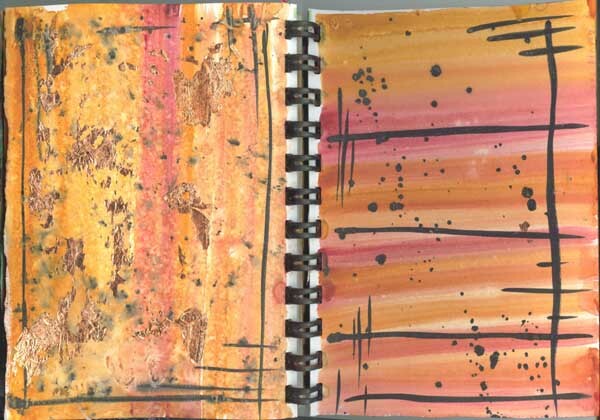 Page 12: I used yellows and oranges and some browns. On the left side I added some copper leaf on the right side I painted some brown lines and threw some brown paint on the page. Don't know what else I'll put on this page. Time will tell. Page 14 "Mushrooms": This page I first cut some masking tape with decorative scissors and used it as a mask. I used dark browns, Naples yellow and reds. 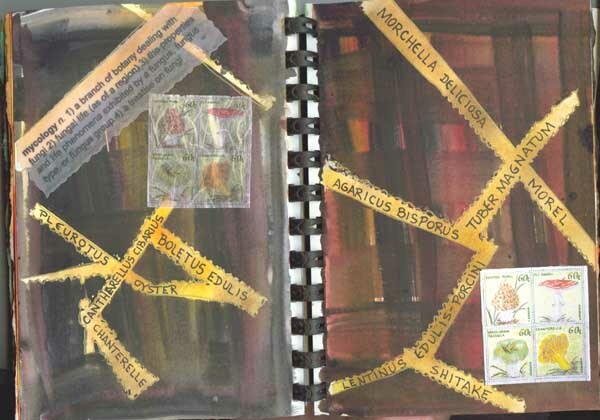 Removed the masking when dry and wrote in the names of various mushrooms in both English and Latin derivatives. I added a picture of some mushrooms I had done in colored pencils. 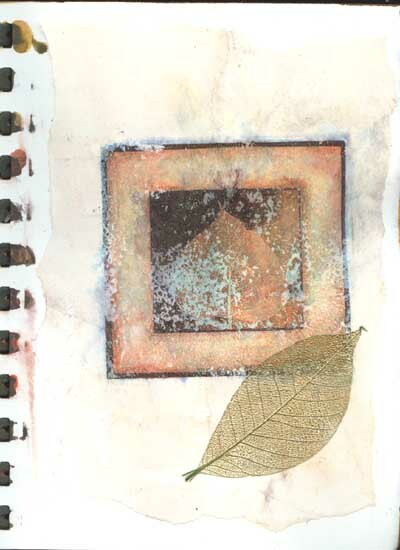 Page 15: We were given an ink jet printed image which we transferred onto our page using water. We lightly sprayed the page and lightly sprayed the front of the image. Lay it down on our page and burnished it to transfer the color. It give a beautiful olden day image. The image was of a leaf. I also added a leaf which I gold embossed.